Thoughts on EQ2 Going Free to Play, and Age of Discovery #EQ2 – Nomadic Gamers, eh! By now I’m sure that everyone has heard the news that EQ2 is going free to play, following the success of their Freeport server. While I’ve personally already said that I think the announcement comes at a bad time I do feel that long term this is probably the best thing for the game to do to extend the life until EQ Next releases. I feel it comes at a bad time because it is a lot to take in for loyal long term customers. Not only have there been an incredible amount of class and gear changes this year, there’s also the fact that we’re getting an expansion that doesn’t follow the ‘norm’ of previous expansions. It’s a lot of change all at once. I would have much rather seen the entire game go F2P when the announcement about the Freeport server was first put forth. Alas, the past is what it is, and we can’t go back there (yet). 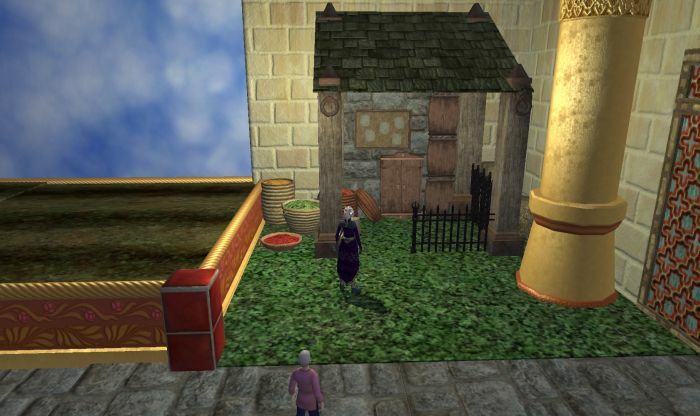 I do have one character on the current EQ2X server that I paid $35 to copy over, and I’m a bit sat that I copied her now since it didn’t include any of her house items 0r coin. I’ve enjoyed how populated the server has been with people in every level range and I’m really hoping that this change draws in fresh blood even if they’re not paying for a monthly subscription. I think seeing an active populace will entice others to pay for the monthly sub to stick around. We’ll just have to see. I was a little less enthralled with the announcement of the pricing for next EQ2 expansion, Age of Discovery. It’s mostly because I’ve already got 12 level 90 characters who are also level 90 crafters and this expansion isn’t going to give me much to do on my level 90s. In fact I’m not even sure I’ll get to keep them all when the game goes F2P, I may have to trim the fat. I really have no need for mercenary, I tend to group to get things done and when I want to solo I haven’t had any issues. I’m not a fan of monster missions which is what the DYOD will be (design your own dungeon) and I honestly have no idea where I would spend any extra aa on my main character. Beastlords are always neat but with so many characters I would have to delete someone in order to play one, and everyone and their goat is going to be doing that. This AoD expansion also does not include any previous expansions, something that has been the norm for some time now. If you’re thinking of giving F2P EQ2 a try you’ll be able to access all content except for DoV (the previous expansion) or AoD. You’ll need to purchase both of them if you want the content from them. On the plus side DoV content is mostly for players 85+ so you won’t need DoV for quite some time, unlike AoD which is aimed for new players and those who haven’t reached the level cap yet. As always I’ll want to poke around the content first before coming to any firm conclusion, these are just opinions off the top of my head without anything to back them up. I may or may not be participating in the beta over the next little while to be able to form some firmer conclusions. What do you think of all the announcements over this last little while? Or are you too busy playing Skyrim to have really noticed them…. A year ago, when we started in on EQ2, we looked at the EQ2X matrix and decided to just go with the classic subscription. While we liked the clear payment plan better, it did mean that it would be more difficult to convince friends to join us. Maybe now they will be able to. I agree that this is probably the best thing for EQ2 in the long run. A while back, I paid to copy over a couple of my 90s to the Freeport server, so I could play with friends who wanted to try the F2P version. Recently, I resubbed to Live for a month, and the biggest difference I noticed between the two was that broker prices on AB were insane. I wondered if that was due to the population of AB being insular, limited and veteran. I’m quite happy with some of the additions that AoD is bringing, and as Bhagpuss points out, if I consider how much I’d have paid for each of those things in SC, it doesn’t seem quite so crazy. Age of Discovery has more in it for me than any expansion since Kunark. I’m happy to pay normal expansion prices for it. In the recent webcast Smokejumper as much as says that they’d have preferred to offer the various strands of Age of Discovery as SC items and it’s obvious they are better suited to that. I’d certainly have paid 1000SC each for mercs, DungeonMaker and Beastlords but I wouldn’t have bought them all at once. I imagine it’ll be done that way in future. In fact, I can’t see any reason this shouldn’t be the last “expansion”. On the Dungeon maker I completely agree with you on Monster Missions. I hated them in EQ1 and indeed Mrs Bhagpuss and I left EQ1 to return to EQ2 at that time largely because of the dominance MMs had. But… we weren’t making our own monster missions. That’s a HUGE difference. I don’t have any interest in playing other people’s dungeons, but I am expecting to spend many, many hours making my own for my own amusement.